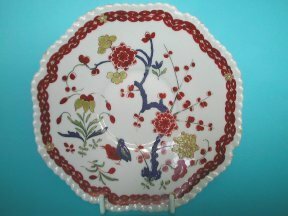 A very attractive early English Bone China plate, 21.5cm. diameter. Made at the Spode factory c.1802-10. Decorated with pattern number 282 ( issued in 1802). This colourful and very attractive pattern in Oriental style, with in particular, the central flowering tree design in Japanese Kakiemon style. The rim with four reserves of Oriental flowers separated by a gilt and iron red fowerhead and scrollwork ground. 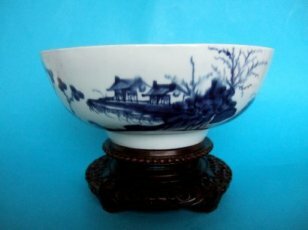 Unusually for English porcelain the back of the rim is also decorated in the Oriental manner and there is also an underglaze blue double circle to the centre of the back. Marked 'Spode' in red enamel, with pattern number 282. Good, some gilding wear to the edge of the rim. Also a chip to the footrim. A Worcester, Flight Barr & Barr, 'Quail 'Pattern Saucer. 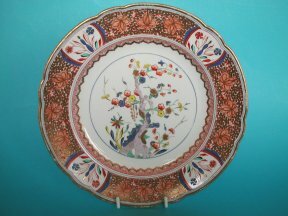 A fine Flight Barr & Barr 'gadrooned' rim saucer, dating from c.1815-25. Painted with a version of the popular Japanese Kakiemon inspired 'Quail pattern'. The saucer measures 15cm. diameter. Several small frits to the gadrooned rim and a small amount of wear. First Period Worcester Bowl. c.1760-70. A Worcester? soft paste porcelain bowl. Painted in underglaze blue with the 'Precipice' pattern. The body, potting and somewhat blurred and runny underglaze decoration of this piece seems rather un Worcester like. Maybe a copy by another factory? The bowl measures 21cm. ( 8.3 inches ) at the rim and is marked with a crescent mark to the base. There is some good quality restoration to a rim crack. Rings well when tapped. 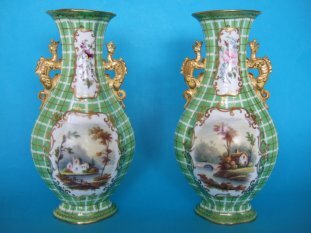 An interesting pair of English porcelain vases from the second quarter of the 19th.Century. Factory uncertain, possibly Minton or maybe Coalport or Masons. Moulded in the shape of 18th.Century Chinese export porcelain complete with Dragon handles. decorated in polychrome enamels with reserves of landscapes on an unusual ground of overlapping green gilt and white squares. The vases stand 25cm. (9.8 inches) high. They have no makers marks. Some poor restoration to both vases but they still display very well indeed.